(Free Press Release) Thirty four companies from various sectors participated in the three-day Mega Job Fair 2014 Event organized by JIS Institute of Skill Development. More than 1000 candidates were selected for various jobs in the three-day Mega Job Fair 2014 Event organized by JIS Institute of Skill Development at its Patipukur campus. The event, hosted from 18thto 20thJuly, saw participation of 34 companies from diverse sectors such as retail, telecom, IT, automobile, FMCG, BFSI, logistics, leisure and security. Pantaloons, HDFC Bank, Eureka Forbes, Domino’s Pizza, Country Club, Wipro, Angel Broking, Bhandari Automobiles, Aditya Birla Minacs, BMA Wealth Creators, G4S Secure Solutions, Ujjivan Financials, Tech Mahindra, India Infoline and Cafe Coffee Day were some of the prominent companies who participated in the event. The event was inaugurated by Shri Ujjal Biswas (Honorable Minster-in-charge, Dept. of Technical Education and Training, Govt. of West Bengal), Shri Madan Mitra (Honorable Minister-in-charge, Dept. of Transport and Sports, Govt. of West Bengal) and Shri Sujit Bose (Honorable MLA and Vice Chairman of South Dum Dum Municipality). 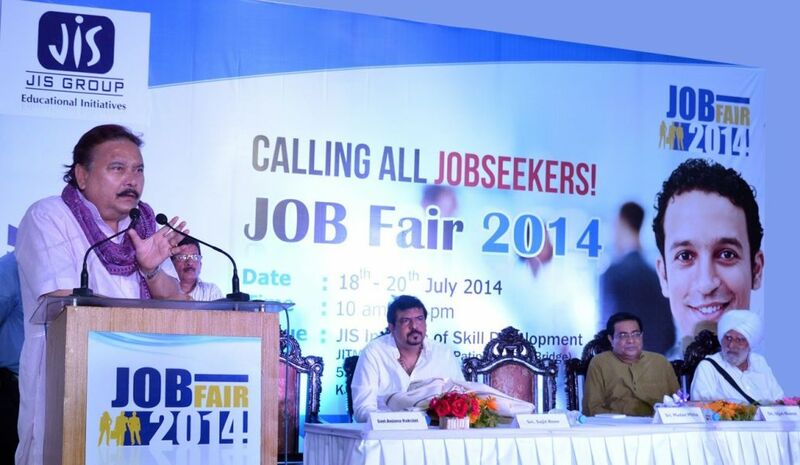 The fair was a mega success with job seekers from all over West Bengal and neighboring states attending it. It recorded more than 2000 footfalls and students were selected as marketing executives, software developers, back office staff, customer service executives, technicians, hospitality service staff, security personnel, etc. JIS Institute of Skill Development is one among the 30 institutions owned by JIS Group, the largest educational conglomerate in Eastern India. The institute is approved by the Director General of Employment & Training (DGET), Ministry of Labor& Employment, Govt. of India and is certified by the National Council of Vocational Training (NCVT), Govt. of India. It offers short-term courses in sectors such as retail, BPO, ICT, courier & logistics, hospitality, business & commerce and automobile. JIS Institute of Skill Development has the latest state-of-the-art infrastructure with well-equipped laboratories, classrooms and library.